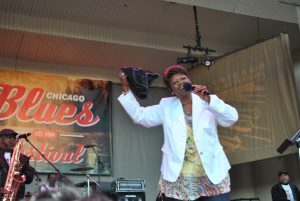 The “Rollin’ Up The River” theme of the 2013 Chicago Blues Fest proved to be an apt description for this year’s performances, which seemed to flow smoothly through blues hybrids, instead of remaining static and focusing on just one form. 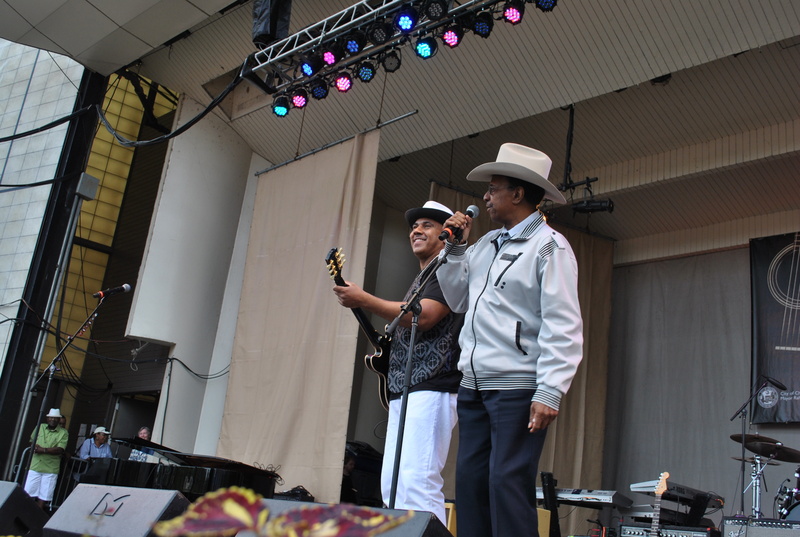 Many headliners showcased the soul side of the blues while others provided heavy doses of electrified Chicago blues, Louisiana zydeco rhythms, and hard-charging blues-rock. The overall effect displayed a clear connection of how much the blues has absorbed while still retaining its essence. The throngs of shoulder-to-shoulder fans, however, seemed oblivious to the musical history lesson played out in front of them as they danced and sang through an especially high-spirited festival. 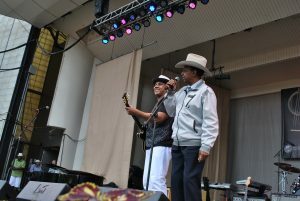 Headliners on June 7 represented Mississippi and Louisiana with very individual and entertaining takes on the blues. 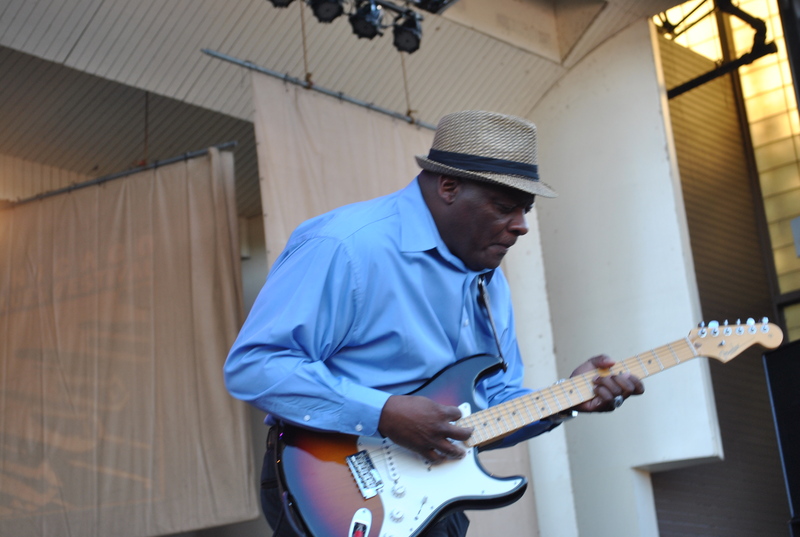 Earnest “Guitar” Roy opened with classic Chicago blues accented by a thumping bassline. 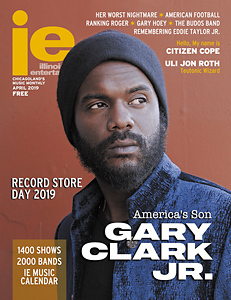 Mentored by Albert King, Roy played the searing guitar licks perfected by Rock and Roll Hall of Famer, with evocative vocals and well-crafted lyrics that reflect his own style, which lies somewhere between the Delta and Chicago. Irma Thomas’ rare Chicago appearance delivered a revelatory experience for her Midwestern fans. The “Soul Queen of New Orleans” quickly demonstrated how she won her royal title with an effortless, mellifluous voice that dipped into raunchy blues, up-tempo soul, and New Orleans boogie with dizzying ease. A contemporary of Aretha Franklin who deserves the same legendary status but somehow never quite developed the same level of fame, Thomas skimmed through 54 years of hits with warmth and grace. She tackled her sassy signature blues tune, “(You Can Have My Husband But Please) Don’t Mess With My Man,” early in her set, belting it out with the same youthful power she possessed when it debuted. 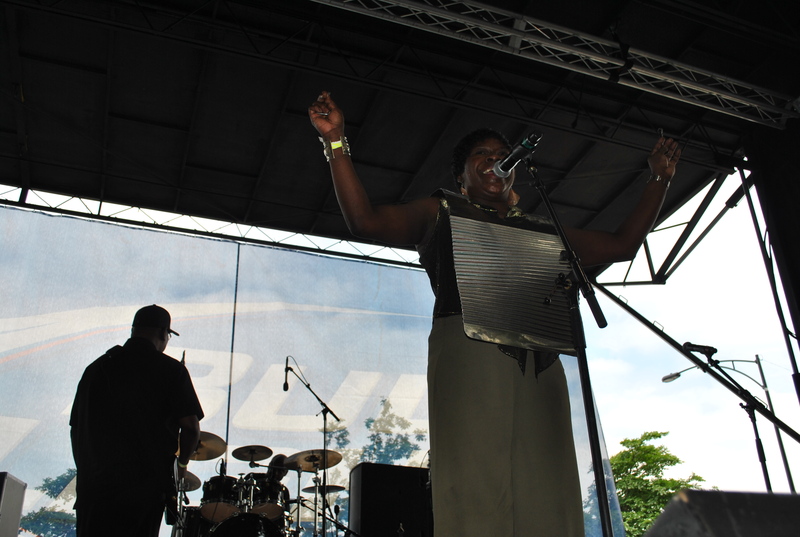 “Hip Shakin’ Mama” served up more raunchy blues that sent the crowd tumbling into the aisles dancing. Thomas explained: “For those of you who are seeing me for the first time, I’m not your typical entertainer. I’ve been out here a long time and there are songs I haven’t sung in a hundred years. So I got with the 21st century and I got me an iPad.” Flipping through the device, she called up the lyrics for every tune the crowd called out for her to sing. Of course, the showstopper occured when Thomas brought “a little New Orleans to Chicago” with the legendary “second line” dance. “Anytime there’s a celebration, the second line is what you do. You wave your handkerchief in the air and you put your back field in motion. I want to see everybody wiggling something,” she said. With hundreds of white tissues and towels waving, she tore into “Iko Iko” and it seemed like the audience would never stop dancing. 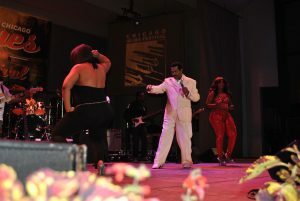 Bobby Rush brought more dancing with his suggestive lyrics and colorful antics. Sliding out in a cream-colored, bedazzled suit, the septuagenarian was accompanied by two amply proportioned dancers whose booty-shaking competed for attention with Rush’s singing. Opening with the wronged man’s lament, “Evil,” followed by his classic, “What’s Good for the Goose Is Good For the Gander,” Rush sang and danced, but his sharp harp playing was the real highlight. A serious hip-shaking show by Peaches Staten and her Groove Shakers started off the performances on June 8 in the right direction. Staten’s high-energy band bolstered her hearty, soulful blues as well as her skill at switching from a funky Tracy Chapman cover with “Give Me One Reason,” to an incendiary zydeco offering complete with washboard playing. Staten left the crowd swaying and chanting as she made over the Marshall Tucker Band’s “Can’t You See” into a blues-drenched ballad. Ronnie Baker Brooks performed for the first time as a solo act at the Petrillo Music Shell and the gifted guitarist didn’t disappoint. Trading monster licks with his bass player Carlton Armstrong, Brooks played straight Chicago blues that got even better when his father, Lonnie, joined him for a “Sweet Home Chicago” jam.